Cajun stuffed peppers ready for the oven. Have you ever had company unexpectedly visit and they stay a little too close to dinnertime? It’s only natural to feel the need to ask them to stay. Sometimes they do, sometimes not. But if they do, here’s a recipe that won’t break the bank, not too involved, and is nutritious as well. 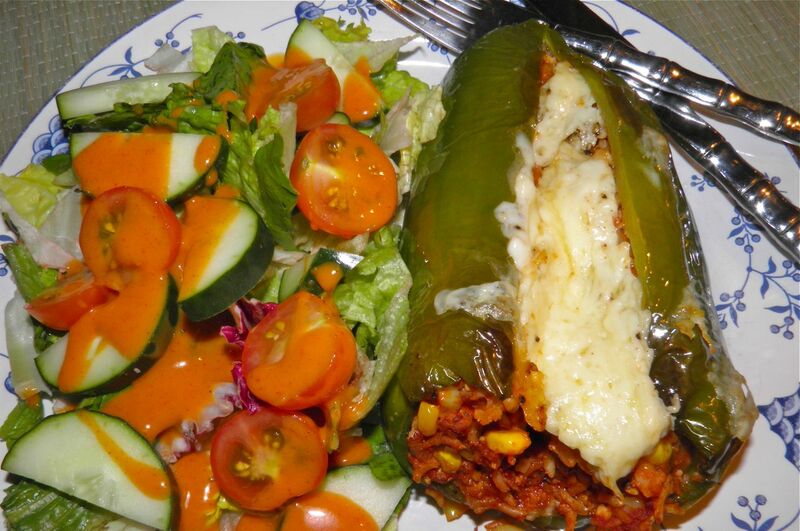 Stuffed peppers can have many fillings. One of my favourites is ground lamb, rice garlic and rosemary. You can stuff peppers with pretty much any meat — pork, beef, chicken, lamb — as well as non-meat. Usual other inclusions are rice, cheese and herbs and spices. Tomato paste is also a usual ingredient. It is commonly agreed that stuffed peppers originated in Greece, although there is also the probability that they were a dish consumed throughout the Balkans since ancient times. Roasted stuffed peppers or tomatoes are always on offer at any type of Greekfest, such as the one we have every June in Halifax. Regardless, these originate now in my kitchen, as do stuffed peppers in kitchens throughout the world. They’re a great way to make a healthy, self-contained, well balanced meal with fairly low cost per serving. This cost is even lower when sweet peppers are in season. For added nutrition I added pinto beans and corn to my stuffing, so there plenty of goodness in every bite. Corn and beans are also an inexpensive way to increase the volume of filling you make. We buy "fresh" store-made andouille peppers at Pete's Frootique grocery. Most available andouille are cured and dried sausage. I would suggest if you can't get fresh to substitute another spicy type of sausage. This is my version for Cajun spiced stuffed peppers. The whole process takes about an hour, so you’ll have time to to chat over a glass of wine with your guest while the baking peppers fill the kitchen with homey aroma. One whole large pepper with a salad can be quite a plateful. If serving only 1/2 a pepper per person, cut the peppers completely in two rather than just cutting a “v” (see recipe). Divide the cheese on top of each half and continue with the recipe. I served a garden salad with (horrors) grocery store salad dressing. I was busy the day I made these. I'll make up for that sin by posting a delicious salad dressing of some sort soon. The cool salad paired perfectly with the spiciness of the peppers. Mix together and place in a sealable spice jar. Remove the andouille sausage meat from its casings and fry. Remove the corn kernels from the cob with a knife by cutting down the sides. Add the kernels to the sausage meat for the last 2 minutes of frying. Place the sausage and corn in a medium bowl. Fry the onion and garlic cloves in a little oil in the same pan. When softened add to the sausage meat. 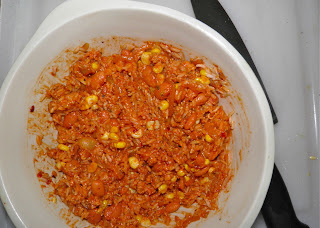 Drain and wash the pinto beans and add to the mixture. Add in the rice, tomato paste and spice. Mix well to combine. Set aside while you prepare the peppers. Cut the tops out of the peppers ad clean out the seeds and any thick white ribs from the inside. Stuff each pepper with the mixture to about 1/2 inch from the top. This helps the filling stay in when the peppers shrink while baking. Rub each pepper with oil and sprinkle with salt and pepper. 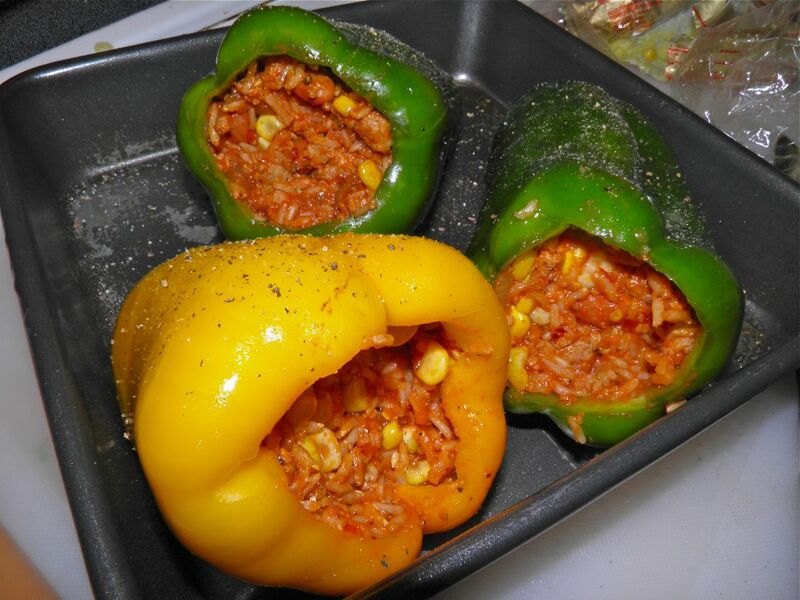 Place the peppers in a baking dish and bake for 30 minutes or until they start to blister. After the peppers begin to blister, grate the cheese. Cut each pepper down the centre while still in the pan, and spread apart to make a wide “v” shape. Place 1/3 of the cheese in each of the open cavities. Put the peppers back in the oven for another 10 minutes or until the cheese has melted.